So, after my concept panel I had a few days off just to rest my brain. This turned out to be a week as many birthdays and other activities came up over the week and so I had lost a weeks worth of work although I could have not done anything to change this. After that week I thought I would set myself a challenge and create a 32 page children’s book based on the original theme of frustration, using my other book Bon Voyage as the base. The deadline for this semester is Monday 28th April which is earlier than the past 3 years which was in May. This meant I had 2 weeks to create this book however, after the concept panel one of the tutors said they didn’t like the paper I had used to create the mock up book for the last story but they didn’t give me anymore information. After researching into what children’s books paper should be I found a few people saying it’s different for each book but on average it’s about 140gsm. For my book I had used 120gsm but the way I made the book I had to stick the papers back to back causing it to be twice as thick. So for this book I wanted to get it officially made. This meant I had to try and get it delivered before the monday – I will have to finish the images and send it off for production a week early. So I have one week to make it – The pressure is on! Even the basics I had to grasp as these are the building blocks of making a good and believable story. 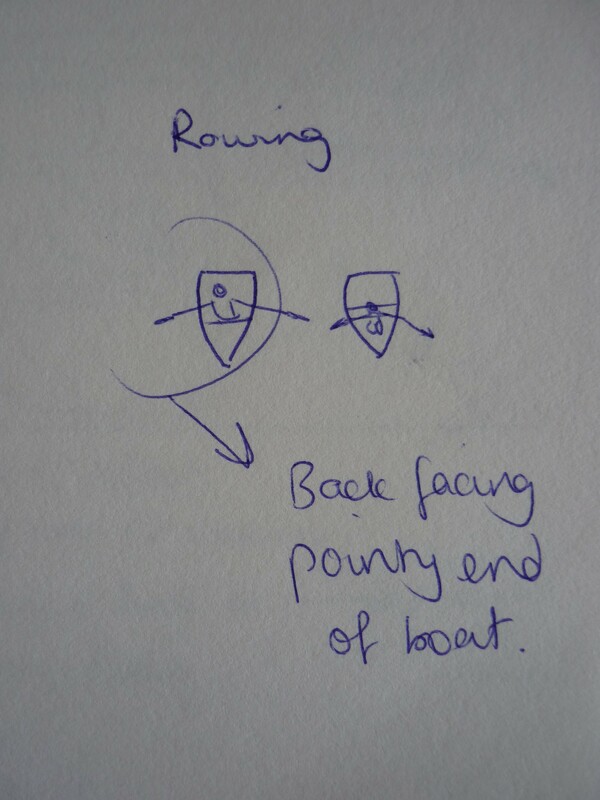 For example to get the rowing boat the right way round. 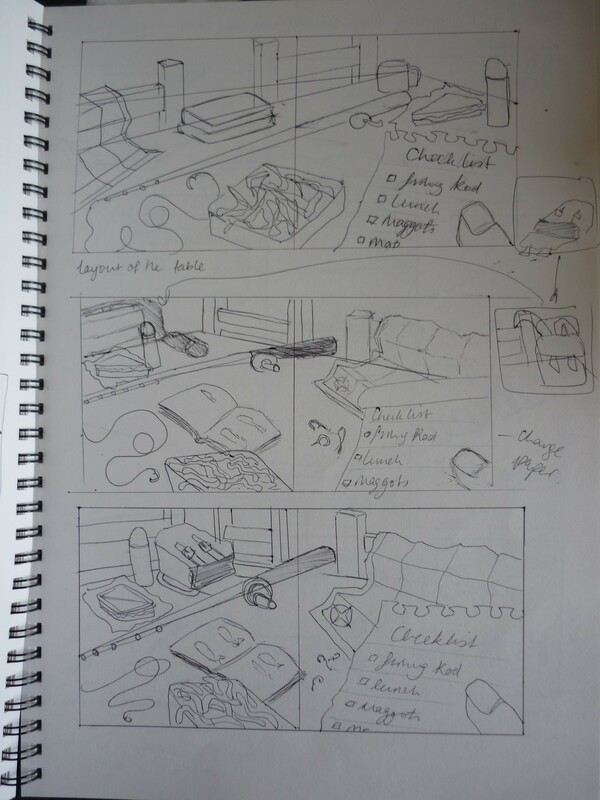 The initial sketches for the first page – I tend to sketch in detail for the first few images and then the rest become relaxed as I know what each scribble means interns of objects. I have created the basic layout for the 32 pages, I am determined to stick to the average 32 pages for picture books, I always go over and it becomes expensive. 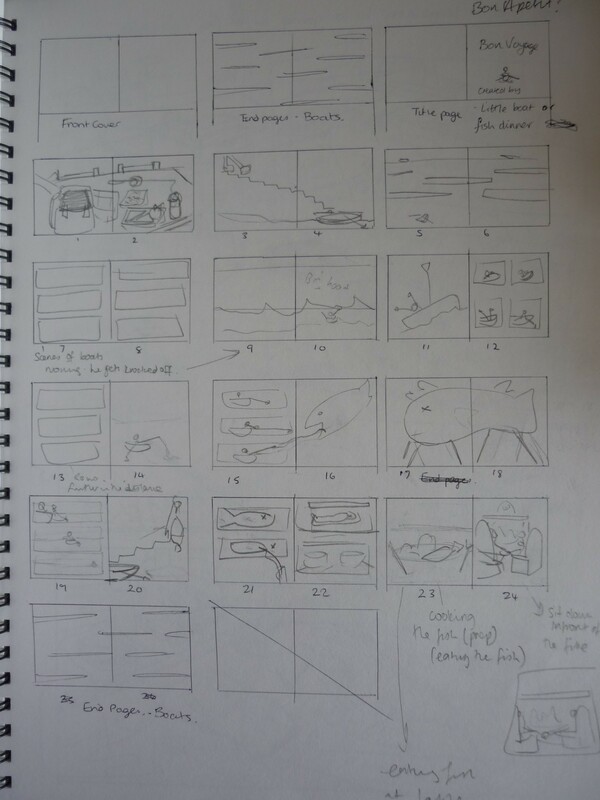 This is what happened with my last book Bon Voyage, it had 40+ page which I had printed out and made myself but this cost £30+ and the tutors didn’t even say anything positive about it so I thought I am going to save time and money by getting it properly made and have less pages.Here is the rough layout of the storyboard. The story is based on a fisherman tackling the seas and cargo ships to get a fish for lunch but when he returns home there is a surprise. So after Day 1 of the task I have thought of the storyline and have created alternatives scenes for each double page spread. This allows me to crack on with drawing the scenes on the computer tomorrow. This entry was posted in Setting a challenge.